The JRL said that India is using National Investigation Agency coercion to defame and weaken Kashmiri resistance. Today, the so-called ‘biggest democracy’ is bullying Kashmiris. Srinagar – In occupied Kashmir, the Joint Resistance Leadership, JRL, has emphasized that the RSS-backed Indian rulers are hatching conspiracies against the demography of the territory that has become a matter of life and death for the people of Kashmir. In a statement issued in Srinagar on August 22, the leadership comprising Syed Ali Gilani, Mirwaiz Umar Farooq and Muhammad Yasin Malik said that the proposed demographic change was directly related to the Kashmiris’ right to self determination and the people would fight against it with complete unity and steadfastness. The leadership also announced a comprehensive protest program against the conspiracies. It pointed out that the plan to remove Article 35A of the Indian constitution was part of the efforts aimed at diluting the resistance movement and suppressing the freedom struggle. In view of the Indian Supreme Court hearing about Rule 35 A, on 29th August 2017, the Kashmir Bar association held a peaceful protest demonstration against the conspiracies to finish state subject law on Friday, 25th August 2017. District Bar associations also held protests at their respective places on the same day. All Civil society, traders’ bodies, religious and social organizations organized peaceful protests on Saturday 26th August 2017. Kashmiri Diaspora living across the globe in UK, USA, Europe, Middle East and Pakistan also organized protests on Sunday, 27th August 2017. People of Azad Kashmir held protest demonstrations on the same day. On Monday, 28th August 2017, Kashmiris living across globe registered their protest on social media by signing a petition in this connection. Students across Kashmir also held protests on the same day. On Tuesday, 29th August 2017, the day when Indian Supreme Court heard this case, a complete and comprehensive protest strike was observed throughout Jammu and Kashmir. The Joint Resistance Leadership said that the RSS-backed [Rashtriya Swayamsevak Sangh – an Indian right-wing, Hindu nationalist organization] Indian rulers are hatching conspiracies. Inspired by Israeli tactics, RSS-backed rulers, with the active support of their Kashmiri stooges, have launched a multi-pronged strategy to change the demography in Jammu Kashmir. Conspirators have taken this case to their supreme court, which immediately admitted the plea, though according to many law-knowing dignitaries, it should have not been admitted as the same Supreme Court, more than once in the past, has rejected similar kinds of petitions on 35 A , said JRL leaders . The leaders said that India is using National Investigation Agency coercion to defame and weaken Kashmiri resistance. Today, the so-called ‘biggest democracy’ is bullying Kashmiris [saying] that if anyone raises his or her voice against the illegal occupation, he will be sent to Tihar jail in Delhi. Similarly, on the GSTax issue, Indian leaders claimed that its implementation in Jammu Kashmir meant economic integration of Jammu Kashmir with the rest of India. Likewise, demonetization is being termed successful because it supposedly has diluted the Kashmiri resistance movement. The United Leadership said that India considers Jammu Kashmir as its colony and is attempting everything to suppress the resistance of the people of Jammu Kashmir, and removing 35A is also part of these efforts. The JRL said that we don’t want our people to suffer in any way, as we all are aware of the hardships people of Kashmir are facing; but when it comes to the issue of life and death, especially in one’s collective (National) existence, no choice is left for a weak people but to show resistance. 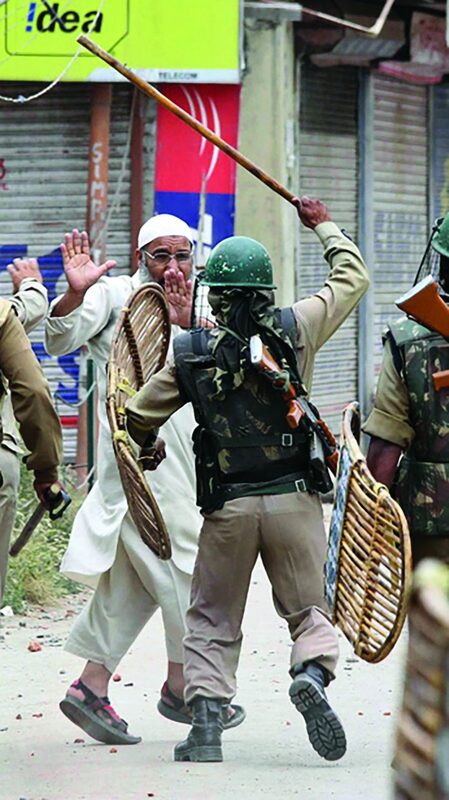 They said that it is India and its Kashmiri stooges who, on a daily basis, are tossing up new controversies to inflame the harvest of peace in Jammu Kashmir. For the last three years, we have witnessed many controversial proposals and ideas being floated by Indian rulers who only want to inflict more and more harm to the people of Jammu Kashmir. This new controversy of 35A is also aimed at hurting our dignity; inflicting more miseries on us and changing the demography of our land, so that our resistance against illegal occupation is finished completely. The JRL also said that as a living nation, Kashmiris fully know to safeguard their dignity and resistance and whatever be the cost, we will resist every evil design of India which is detrimental to our sacred cause. JRL said that any meddling with state subject law is only aimed at changing the demography of Jammu Kashmir. This issue is directly related to our right of self determination, and so we all need to fight for it with unity and steadfastness. JRL said that this matter is related to our life and death, and we will not shy away from spilling our blood to safeguard it.